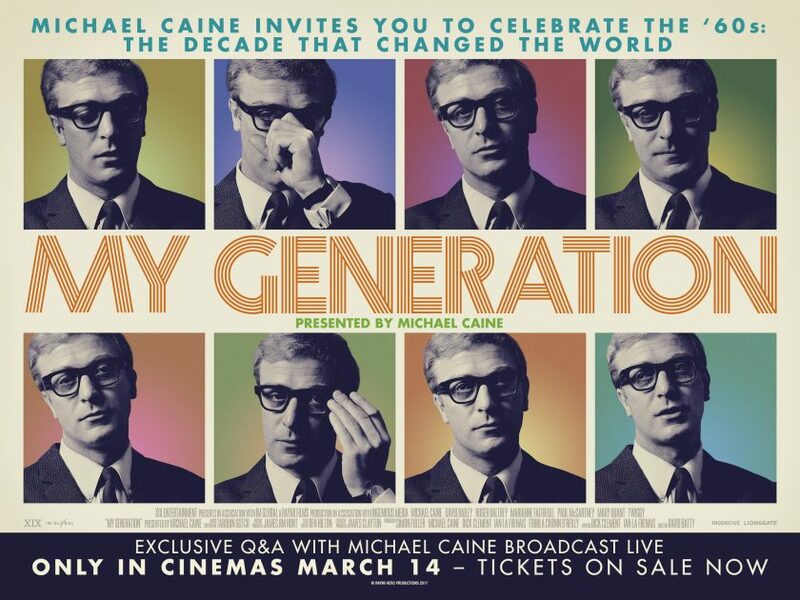 Lionsgate today announce that in a special event coinciding with Michael Caine’s milestone 85th birthday, on Wednesday 14th March the engaging and evocative documentary, MY GENERATION will broadcast LIVE via satellite from the BFI Southbank to cinemas across the UK and Ireland followed by a Q&A with the iconic star. MY GENERATION, which received its world premiere at the Venice Film Festival and played to a sell-out audience at the 2017 BFI London Film Festival, will be on general release in cinemas from Friday 16th March. ‘My Generation’ uses carefully intercut audio of Caine’s conversations with his co-stars blended with un-seen archive material to take the movie viewer back to the heart of the 1960s. In one poignant sequence, we accompany Caine as he drives through Piccadilly Circus today overlaid with original 60s film to create a remarkable time travel effect.